How many teenage dropouts eventually return to school, and why? Which students drop out permanently and which ones reenroll? And what results do the returning students achieve during the conventional four- or five-year time frame for high school graduation? For years researchers have painted a statistical portrait of high school dropouts—which demographic groups do better or worse, at which grade levels they are most likely to fail, and how leaving school prematurely affects the future behaviors and earnings of adults. These and other trends provide a retrospective on American students who don’t obtain a high school diploma. But until recently, researchers have ignored the story of what happens to high school dropouts who return to school. A new study from the Regional Educational Laboratory West at WestEd focuses on these students who have moved in the shadows of the education system. The research offers some surprising details to our understanding of the transitions that young people make—or fail to make as they navigate through school. The study also reveals important lessons for education leaders and policymakers who seek to address the broader dropout problem throughout the country. Do High Stakes Tests Drive Up Student Dropout Rates? "Advocates [of high-stakes testing] argue that … the threat of missing out on a diploma or, for younger pupils, of being retained motivates students to work harder, resulting in higher academic achievement. Critics, on the other hand, argue that … just anticipating such failure can push some students over the academic edge, causing them to quit school." This final report, written by WestEd's Jaclyn Tejwani, Valentin Pedroza, and Jodie Hoffman, presents to the Texas Education Agency (TEA) a description of the activities and results of the evaluation of the Texas School Dropout Prevention and Reentry Program (TSDPRP) grants. This study, prepared by REL West, follows a cohort of first-time 9th graders in one large urban school district from 2001/02 to 2005/06 and documents dropout, reenrollment, and graduation rates. 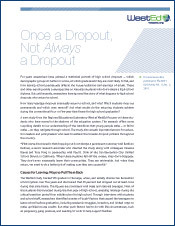 A two-page synopsis of the report, What Happens to High School Dropouts Who Reenroll?, is also available.